The 21st Annual Palms Bicycle Rodeo is just two weeks away!!! – Bring the family for an educational fun-filled day on Saturday May 10 from 10am-2pm at Palms Elementary School, 3520 Motor Ave., Los Angeles, CA 90034. This year’s Bike Rodeo will feature an Interactive Bike and Traffic Safety Course presented by Safe Moves, a non-profit organization that provides bicycle safety and transit education programs for Elementary and Middle Schools. 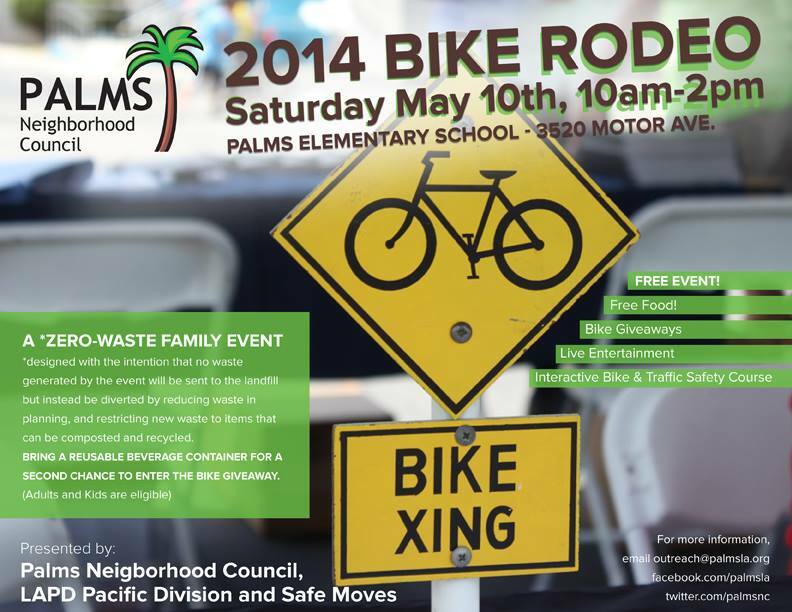 We are also pleased to announce that in 2013, the Palms Neighborhood Council (PNC), a leader in the urban sustainability movement in Los Angeles, took great strides toward making the Palms Bike Rodeo a “Zero Waste Event” (ZWE)…and WE’RE DOING IT AGAIN! A ZWE is designed with the intention that none of the waste generated by the event will be sent to the landfill, but instead will be diverted by reducing waste in planning and restricting new waste to items that can be composted and recycled.